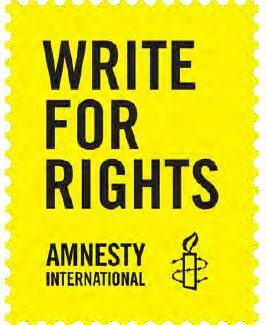 The D12 Human Rights Committee invites members to participate in Amnesty International’s Write for Rights campaign on December 10, 2018 (International Human Rights Day), in a write-athon to be held at A Different Booklist. Each year, hundreds of thousands of concerned citizens from around the world participate in Write for Rights, to pen letters of support to human rights and social justice dissidents and activists who are persecuted and oppressed for their work. Past Write for Rights campaigns have helped to convince governments to release incarcerated dissidents, commute sentences, and end torture. Information on the broader Amnesty International campaign can be viewed here. This year’s campaign will support ten women human rights defenders. Their cases are explained in the .pdf below. D12’s event, hosted by the Human Rights Committee, will be held at A Different Booklist Cultural Centre, at 777-779 Bathurst Street, from 5 to 7 PM. Writing materials will be provided, and postage paid by OSSTF. The event is planned for 40 members, and is open to all D12 Bargaining Units. Please consider posting or circulating the flyer below at your worksite. Please RSVP to Chris Chandler, at cchandler@osstftoronto.ca, by December 3, 2018, using the subject line “D12 Write for Rights on International Human Rights Day”.